A whoopie pie is usually 2 pieces of cake, squashed together with a creamy filling in the middle. The cake can be chocolate, vanilla, gingerbread or in this case pumpkin. While walking around Marshall’s a few days ago, I spotted a Whoopie Pie pan on the sale rack. This baby was $5. I believe I earned it as I had to stand in line for 30 minutes for it. I knew Whoopie Pies were in my future but I wasn’t expecting to come across a pan. Actually, I didn’t even know they made Whoopie pans. The pan works great as it creates the perfect pie shapes. I love it! What a great $5 investment! Don’t you just love it when you bag a great bargain and get to use it almost immediately? The whoopie pie cakes are easy to make. Start by mixing the oil and brown sugar. Add in the pumpkin puree and eggs. Mix to incorporate them well. Add in flour, salt, baking powder, baking soda, vanilla, cinnamon, ginger, and the cloves. I like to sift my dry ingredients in all cake recipes. This gives the cake a soft, and airy feel. Now that you have the batter, using a spoon, transfer it onto the Whoopie Pie pan. If you don’t have a pan, you can always use a baking sheet. 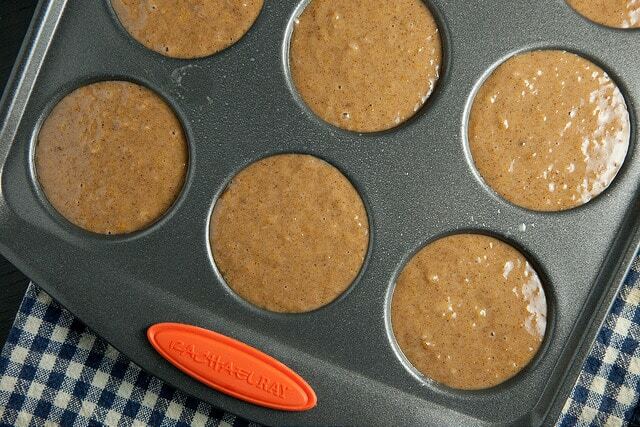 If you’re using a baking sheet, try to ensure that your batter forms a good circular shape. The better the shape of your batter, the better looking your pies will come out. If you’ve been following my recipes, you know that I love all-thing pumpkin. And if it’s fall, then you got to have pumpkin desserts in your table after dinner. 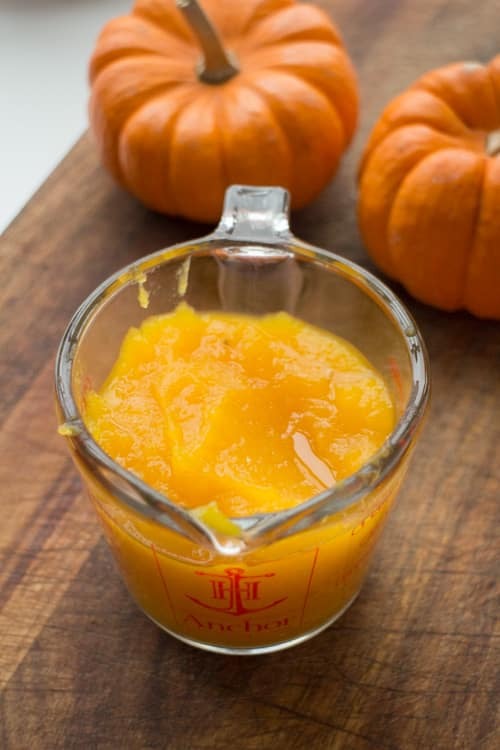 Sadly I had to use my last batch of frozen pumpkin puree in the freezer. Don’t worry though I have a few more pumpkins to cut open and get puree out of! More Pumpkin desserts to look forward to? Possibly, yes! If you’re just as obsessed with pumpkin desserts, I suggest trying out my Pumpkin Baby Pancakes and my Pumpkin Cream Pie. While your whoopie pie is cooling, it’s time to move to the whoopie pie filling recipe. This whoopie pie filling recipe calls one 1 egg white. There are quite a few ways to get this done. 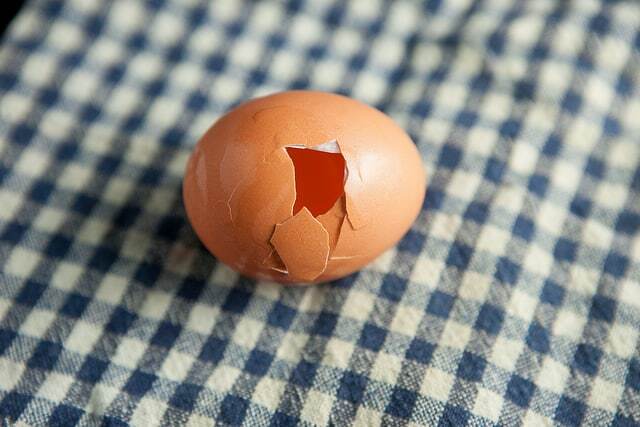 But my technique is to crack a little hole in the egg so the yolk stays inside while the white come out. Whisk in the rest of the ingredients to get a fluffy batter. You might have to do this for a good 10 minutes. We needed a creamy filling for this whoopie pie filling recipe. And boy, was this great? I might have taken 4 spoonfuls of this before even filling one pie. As soon as you start to put a little bit of cream on top, the world gets a little better. You can also freeze this whoopie pie filling recipe for up to 2 months for later use. Transfer the filling onto your cakes. Squash the filling with the second cake. The world becomes just perfect. Is it just me or does anyone else just see a bunch of smiling mouths when they look at a bunch of Whoopie Pies? Serve immediately. You can also wrap these whoopie pies individually in plastic wrap for storing. 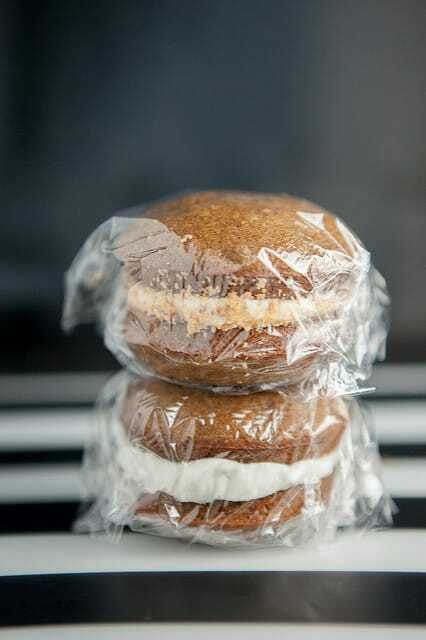 Hope you enjoy these Amish Market Pumpkin Whoopie Pies! 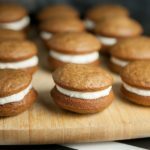 This is an easy pumpkin desserts recipe that makes moist pumpkin whoopie pies with my delicious marshmallow whoopie pie filling recipe. 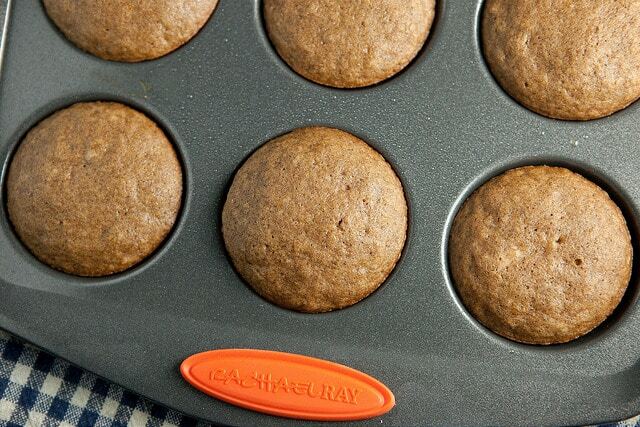 Lightly spray your baking sheet or Whoopie Pie pan with nonstick spray. Combine oil and brown sugar. 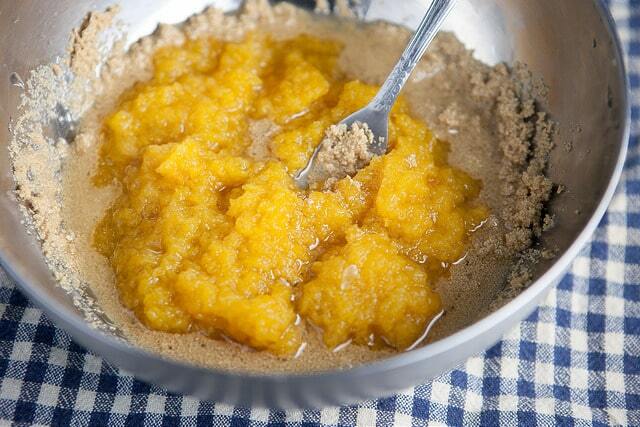 Mix in pumpkin and egg until well combined. Add flour, salt, baking powder, baking soda, vanilla, cinnamon, ginger and cloves. Mix until all combined. Drop spoonfuls of pie batter onto a baking sheet or Whoopie Pie pan. If using a baking sheet, try to make it as circular as possible as this will be your pie shape. Spread cream filling on one pie, while using another pie to press it down. Enjoy immediately or wrap in plastic wrap to store. In a large bowl, beat together all of the ingredients until fluffy. This make 12 Whoopie Pies. There is seriously nothing in life quite like an Amish baked good. ESPECIALLY the pies for me (why is my pie crust never that flakey??) Love these pumpkin little cuties. Just in time for Halloween! I know, isn’t the crust always the best? I know, they make amazing everything, even pizza, I love it all! Whoopie!!! Pies. Perfect little bites especially with pumpkin in them! Thanks Kelly, loved your pumpkin patch! I love your method for removing egg whites. Genius! These look fun to make. Actually, you make everything look fun to make. Your kitchen must be a blast all the time. My kids LOVE pumpkin whoopie pies. I never expected that so I’m up for trying and finding all the best recipes! Pinned! WOW. Pamela, look at these, they a look so beautiful, golden and super moist. Beautiful! Oh…they look so delish!! I can’t bake to save my life, but I think I’d like to give these a try. I’ve seen the whoopie pan at our local grocery store Wegmans, but have passed it up. I’ve considered buying it for small cakes for strawberry shortcake..but then just never did. I’ll have to look to see if it’s still there. Hope you get it Prudy and whip up a batch of these glorious pies, enjoy! Hahaha, classic story of Marshall’s, HomeGoods, or anyplace similar – something awesome being super cheap, but then having to earn the right to buy it by standing in line FOREVER. I can relate, obviously. These are just glorious! I would take one of these over a handful of Halloween candy any day! I’ve never been to an Amish market, and now I want to go! Actually, I’ll just make your whoopie pies because they look so perfect. I love the shape of yours, and those crushed Butterfingers are really sending them over the top! Pamela, these are the creme de la creme! You’re killing me having to look at all these amazing photos. I might have to make a trip up the East coast just for these, so …….. delightful! whoopie pies – I have never had them but if I see anything at the Amish market, I will make sure to get it. Who doesn’t love a dancing ghost?! Delicious recipe. Gorgeous pictures. I’ve never visited Amish country but if they’re good bakers I know I’ll love it there! 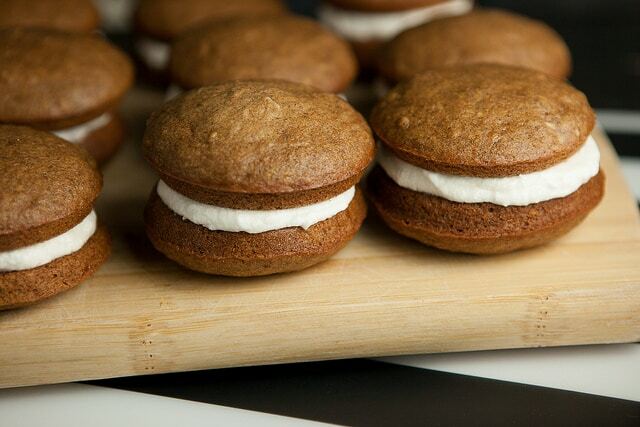 Pumpkin Whoopie Pies are a favorite of mine this time of the year. I’ve already made a couple of batches and they sure don’t last long. I love what you’ve done with them to jazz them up even more by sprinkling them with butterfingers. Who could resist! Shoo fly pie, girl, you know where it’s at! Make sure to grab a Whoopie Pie next time! 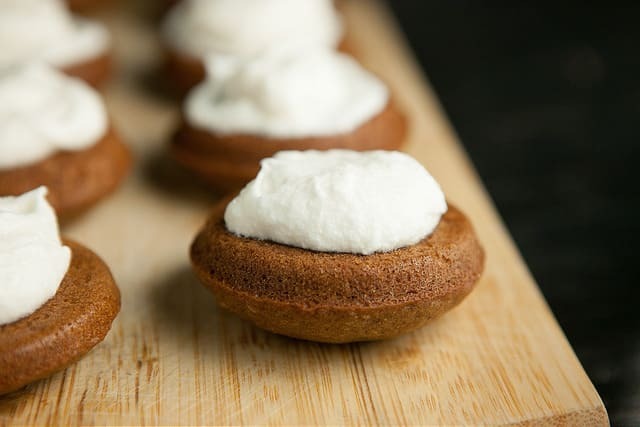 Pumpkin whoopie pies! So fun! I especially like that you rolled them in crushed candy – such a good idea : ) I wish I had a sweet treat now to eat after my lunch! They’re the best. Enjoy Mary Frances! Thanks Ada, I love a good sale! I agree with you, there is nothing like Amish baked goods. I always pick up a pie from the farmers market here because they come up from PA (which makes me side with you on PA winning this battle!). I love your whoopie pies. Looks fabulous. The pan was such a steal too!! Glad you agree that Pennsylvanian wins! 😉 Enjoy! Oh my goodness! These are the ULTIMATE fall treat, and I’ve got to try them for myself! That soft cookie with the sweet, heavenly frosting? Dying! Hope you make some Georgia, they’re delicious! 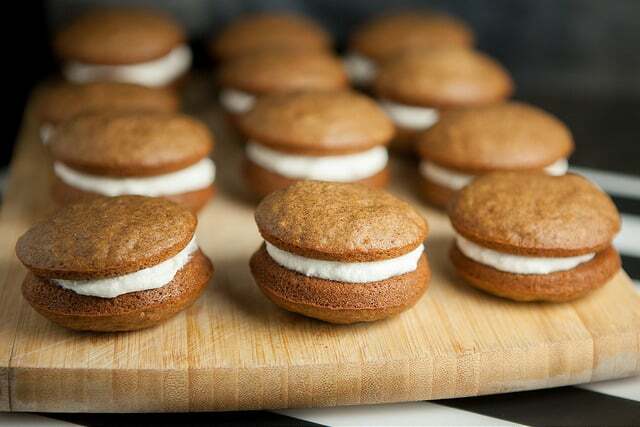 Pumpkin whoopie pies have been on my list to make forever! You have totally inspired me, especially since you dipped yours in one of my all-time favorite Halloween candy! I was on board with pumpkin whoppie pies and then you rolled them in crushed Butterfingers – oh my gosh! A whoopie pie pan, what a find!!! I want one. Lovin your pumpkin whoopies but am totally in love with the crushed butterfingers on them.. I love pumpkin whoopie pies, but I love it even more since you added the butterfinger crunch on the sides. 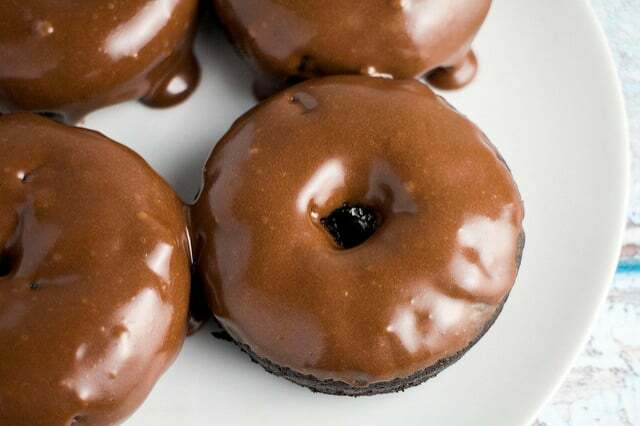 I really wish I had some of these right now, yum! I love whoopie pies and pumpkin are probably my favorite kind. Yours look SO good and I love that you rolled some of ’em in crushed candy. YUM! Oh my gosh! I totally need that whoopee pie pan. I love to make whoopee pies, but it is so hard to make them uniform without a pan. I spend like 5 minutes trying to pair together the ones that are the same size and shape! Love the idea of adding butterfingers. Yum! Happy Halloween! Hi Christin, I totally know what you mean about trying to keep their shape even, this pan saves all those problems! Absolutely see the smiling mouths! Your whoppie pies came out great – I’ve never made them and always been curious as to whether the pans work well. Now I know! Enjoy Halloween – weather looks good!! So interesting – I used to visit Amish country when I was a kid but don’t remember whoopie pies. I do remember shoofly pie though. These look fantastic! LOVE these dressed up whoopie pies! No – its not just you – looking at your photos had me grinning from ear to ear! Yum, these whoopie pies look absolutely perfect for my cup of coffee tomorrow morning! Love the extra butterfinger crumb coating on the edges! An Amish market? How cool…I would love to go to one! Thanks Koko! The market is full of goodies! I’ve never had whoopie pies before (shocker, I know! ), and now all I want is this pumpkin pies! Love love love!! Hope you get some girl! Seriously, these whoopie pies are making me drooling right now! How did you make them so perfect? Oh, right, you are telling us how to make them documenting every step with fantastic pictures. Thanks for sharing, I’m pinning and saving the recipe! So glad you enjoyed these Whoopie Pies Daniela! I agree. It’s hard to stop at one! they look great! funny, the best one i had was from an amish market! Glad to hear that Dina, they are the best right from the market! Hope you give them a try Tina! Oh my goodness I LOVE Amish markets! They make the best animal crackers ever. <3 and pretty much everything else. Oh my… these have me drooling & I know my kids would LOVE THEM! Hope you all enjoy Pam! Oh, do these look terrific! I hope my next batch looks as good as yours…and I’ll drefinitely add the butterfinger crumbs! YUM! oh my oh my! Now these are my kind of Fall treat. Yum Yum Yum! Enjoy Nicole! Our local farmer’s market brings quite a few Amish, and you are totally right – the baked goods are SO amazing! (The produce is pretty darn good, too!) My favorite – the pretzel bread. SOOO good!!! They always have great produce too, it’s such a great time at the market! Enjoy these Whoopie Pies! These look so delicious! I wish I could grab one right through the screen. We don’t have Amish people in Australia… unfortunately or I would know what a whoopie pie is meant to taste like! Hi Pamela, Really a great to find your blog and go through the recipe you have shared. It look to healthy and delicious. Thank you for sharing with us. Best $5 ever spend. No contest! Whoopie pies sort of had their moment in the sun and then everyone forgot about them. I’m glad you didn’t! They are so, so good! We grew up near an Amish Market, too! Love them. And these whoopie pies look perfect! I’ve debated about purchasing one of those pans… but now I can really tell that they make such perfect whoopie pies. Which I love! (Especially pumpkin!) I’ve never been near an Amish Market. Don’t even think there are not any out here in Utah– just polygamy…everywhere! (And, I mean…everywhere! If you see a pan on sale, I would definitely get it Gloria! I hope you try them Tara! Great idea for the Butterfingers! They’re awesome I bet! You know, I have a whoopie pie pan AND I make pumpkin whoopie pies but not in the whoopie pie pan – just freeform on a Silpat. Go figure! Give it a try Averie, the shapes it makes are near perfect! I bet it would be hard… no, impossible… to eat just one of these. Yum! I looooooove pumpkin whoopie pies! The Baked bakery recipes is crazy good. I make it over and over and over. And I made homemade marshmallow fluff for the middle. I always roast my own pumpkins too. Some are headed in the oven now. I need to make whoopie pies with them! I’ve been to Amish Country once and it was such a cool experience. They sure do know how to bake! I was laughing when you said you had to wait in line for 30 minutes at Marshall’s – that always happens to me whenever I go there, lol! These whoopee pies look crazy delicious. I need to try this recipe! Thanks for sharing at Saturday Night Fever – pinning now! Glad I’m not the only one who has had to stand in line at Marshall’s, it’s always a madhouse! Whoopie pies for everyone…I’m in for that! These look absolutely scrumptious! I know they’d be a big hit in our house! Aw! I had no idea whoopie pies were Amish! But I knew they were delish! My kids will flip when I make these (we usually buy them at Fairway.) Visiting from FoodieFriDIY. I want 10 of these, in my mouth – all at the same time! ha ah! Flavor EXPLOSION!! 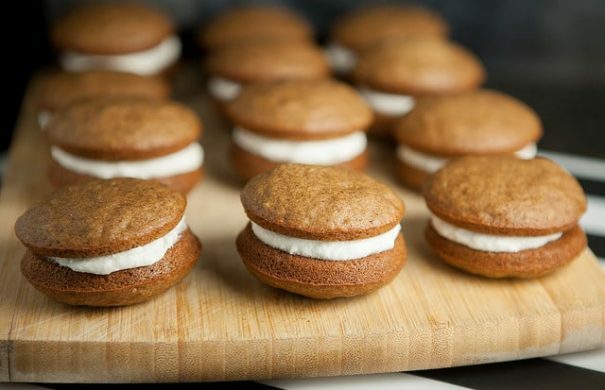 I love pumpkin whoopie pies recipe. I need to add honey to recipe and it would be perfect. By the way I found your post from Pinterest !Thx for sharing unique recipe, Pamela! These all most look too good to eat. I am sure I definitely won’t be able to keep the hubby and grandkids out of them. 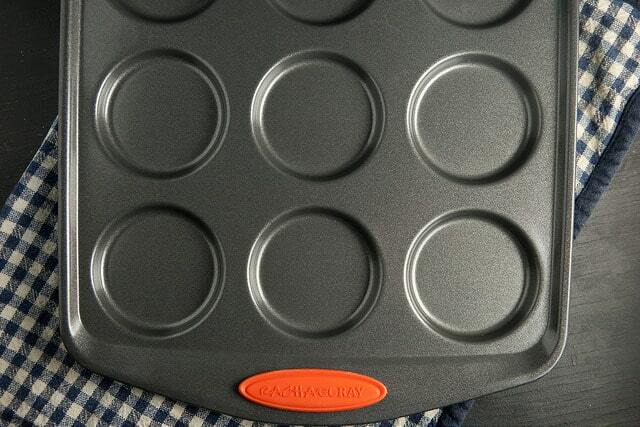 Hey Sandy, you could use a muffin pan, or even easier just use a cookie sheet and make circles with the batter. Hope you enjoy! Whoopee pies are a family favorite here. I’m notorious for failing at Pinterest. But that won’t stop me from pinning this and unsuccessfully trying to make it! Oh my! I need that pan! And these whoopie pies sound so good! Thanks for sharing and happy Fiesta Friday! Saw this on the Sweet Inspiration link party. They look so yummy and who doesn’t love some whoopi! Yes, the Amish definitely know how to bake! We’ve got an Amish market not too far from us…and the apple pies are just amazing! We haven’t been in years, though. I think that we might just have to change that soon (or at least before Thanksgiving) Thanks so much for sharing at the #happynowlinkup! Yep, these are the bomb. Yum!!! Don’t they look too cute? Thank you for bringing these along to Fiesta Friday! Pinning and sharing! I grew up in Waterloo County, Ontario, where there is a large Mennonite population. Their cooking and baking is amazing!! Love your Whoopie PIes – they look so tasty. They would definitely make me smile. Thank you so much for being a part of the Hearth and Soul Link Party. Hope you will visit again this week. Have a lovely week ahead! I live in the Amish Country in PA. At my old job we had a family of Amish ladies who came in and baked for us. This recipe is pretty well spot on. If you want to step it up a little, forget the marshmallow filling and substitute a cream cheese filling like in a pumpkin roll. It’s almost as good as ….. Well, use your imagination! Hey Greg, I’m so happy to hear you liked these whoopie pies! Thanks for commenting! Hey Cathy, sorry for any confusion, the pies call for 1 egg and the filling calls for 1 egg white. I updated the post to call this out more directly. Enjoy! I’m from Canada, here pans that look similar are used to make ‘muffin tops’, actually just the top of a muffin that people will eat first on a regular muffin. 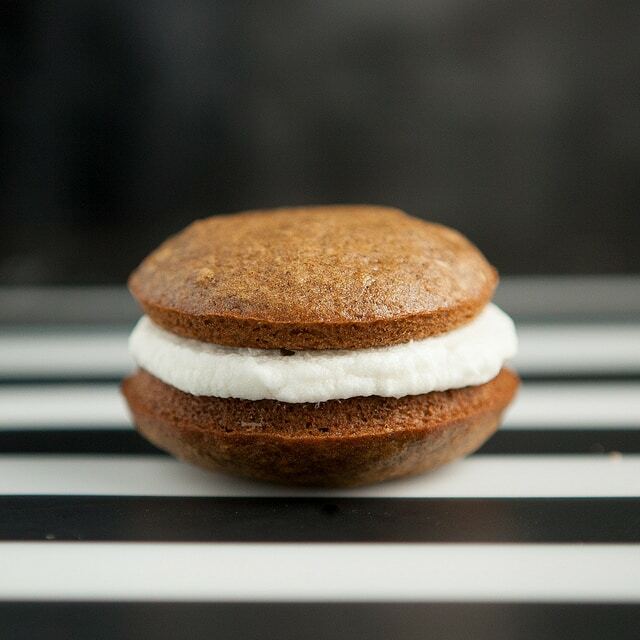 These pumpkin whoopie pies are so Instagrammable and adorable! As you know I made it a short while ago and it was lovely! Thx for sharing!